Packed with heartwarming stories and vibrant artwork, this issue is a great read for the holiday season. A sweet, but mostly unremarkable collection of short Christmas-themed stories from the DC universe. An OK seasonal read to get you into the holiday spirit. The whole thing gets a 3.5 but Superman & Batman in "The Last Minute" gets 5 stars. These were enjoyable. Not gonna lie, I read this mostly (ok entirely) for the Jon and Damian story which is the one I gave 5 stars. It was incredibly cute! You get such a great feel for the relationship between Damian and Jon and how that's progressed. There's an adorable Jingle All the Way esque subplot with Clark trying to buy the toy Jon really wants on Christmas Eve. He can't get it because Damian buys the last one and gives it to Jon. So incredibly cute! Also, there's also an adorable moment where Clark asks Bruce if he would like to play. Loved this! The others weren't memorable enough to really like or dislike. "For The Dog Who Has Everything" was clearly a metaphor for Jon maybe feeling distant from his Kryptonian heritage. It was okay but nothing that really moved me. Batman &a Detective Chimp "The Night We Saved Christmas" did absolutely nothing for me. Wonder Woman &a Constantine in "Dreaming of a White Christmas" was pretty good. Not a lot was done with Diana. There's a interlude where she talks about the holiday traditions on Themyscira and that was great! I wish I could've gotten more of that. Flash "A Flash Christmas Carol" reads like a typical storyline I would expect from the Christmas filler ep on the CW show. I'm surprised no one said "God bless us everyone one" at the end. New Super-Man in "Day of Returning" was intriguing. I definitely want to check that character out. Batwoman "Light In Dark", the writing for Kate felt stilted which made me sad because I was actually interested in the plot. The Titans "What a Year For a New Year" was pretty okay. Roy talking about his addiction was moving. Batgirl & Nightwing "I Don't Wanna Be Late" was cute but literally a footnote. Not sure why they even bothered including it. Green Lanterns "The Epiphany" was Simon and Jessica going through trials to prove they can be Green Lanterns. Full confession, I've never been interested in Green Lantern stories. No matter who's holding the ring, I'm just not that interested. That being said, I'm sure there's something here for people who are interested in the Green Lantern. 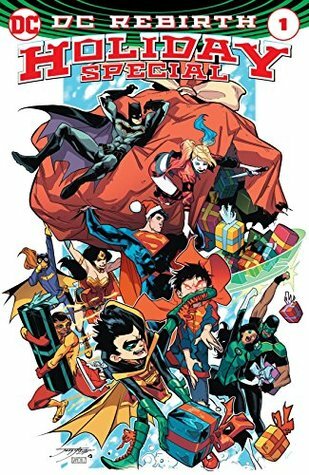 With 10 short stories in all, the DC Rebirth Holiday Special is a feel-good compendium of holiday adventures with some of our favourite DC heroes. The collection is narrated by Harley Quinn, who I thought was a great choice because she anchors the book with both humour and heart. They do a really good job of making her segments the connective tissue, sort of in a variety show gone wrong kind of way. I will admit, the first half of the anthology is the stronger of the two, but what all these stories have in common is tight storytelling that embraces the holiday spirit in a natural and sweet way. The artwork is consistent and vibrant, as one comes to expect from DC. At 88 pages, this is definitely a fun addition to add to your collection if you're willing to pay the steep price for some stellar hits and near misses. Do I have certain genres, and sub-genres that I'm a sucker for-yes. Christmas stories among those categories yes-I mean Christmas Carol is one of my favorite movies in many forms (including Bill Murray, Alistair Sim, etc. )And, in the comic realm DC usually does at least a mildly entertaining book the years they do a holiday special. Capitalizing on Harley Quin and Suicide Squad's popularity, Harley is the master of ceremonies in the framing story as multiple DC characters take the stage.Superman and Batman's stories are about what you expect as they are the light and dark of DC's heroes. Nightwing and Batgirl are in a nice one page short, and John Constantine's short has some fun moments. The Flash story was a nice entertaining surprsie. Is this great-no. Is is a decent read for those struggling to find some Christmas cheer this winter-yes. Neden böyle beklentiyle başladığım şeyler beni tatmin etmiyor anlamıyorum :(Batman, Constantine ve Flash hikayeleri hariç hiçbir hikayeyi beğenmedim. Hele ki o çizimler... Harley Quinn'e zahmet edip bir şey demiyorum bile. There's a couple of dud, leaden stories here but it's mostly good. The framing sequences are light and the Night We Saved Christmas story with Batman and Detective Chump was a joy. This is everything right with the DC Rebirth. I loves the superman/batman story, green lanterns and the flash story!! This was the best thing to get me into the holiday spirit this year! Fun read. Something for everyone in it. Heartwarming and inclusive. DC has an amazing creative team. Esta clase de antologías sirve a modo de paneo sobre todo lo que la editorial está haciendo, para descubrir tanto personajes que quizá no sean los tradicionales o mostrar las circunstancias nuevas de los personajes tradicionales, o también para dar a conocer a guionistas y dibujantes no del todo afianzados en el mainstream mediante una historia breve de pocas páginas. Lo que también suele ocurrir con estas antologías es que es muy difícil que entreguen buenas historias y, para colmo, al encontrarse DC en su no sé cuanto reseteo -fuera de joda, Rebirth? New 52? cuantas veces más van a hacer esto?- y por regla general, sus series tocando fondo, poco y nada deberíamos esperar de este especial navideño. Y, para qué seguir dándole largas, cuanto menos esperemos mejor nos irá, porque es olvidable en su inmensa mayoría. Para no meternos en historia por historia y perder el tiempo con material que no vale la pena, me voy a limitar a destacar lo bueno y lo salvable (siempre hablando desde mi opinión). Lo bueno no es bueno. Es MUY BUENO. Hablo del cruce entre ese bizarro personaje que es Detective Chimp y Batman en la historia The Nigh We Saved Christmas, de Heath Corson, Gustavo Duarte y Marcelo Maiolo. Fuera de joda, si este trío arrancara una serie del Detective Chimp en este tono, me anotaría de inmediato a seguirla. Bien calibrada en humor, acción y con unos dibujos geniales (como Duarte nos tiene acostumbrados a todos los que podemos ver sus laburos en Brasil). Luego, hay un par de historias pasables. Dreaming of a White Chrismas, tiene al (creo yo) inédito combo de John Constantine junto a Wonder Woman en una historia legible de Mariko Tamaki (que parecería precisaba alguna página más para desarrollar toda la idea) ilustrada como los dioses por mi compadre Matías Bergara (si piensa ud que no estoy siendo objetivo, lo invito a googlearla). A Flash Christmas Carol tiene una buena historia de James Tynion IV ilustrada por un pechofrío llamado Robbi Rodríguez, con un Flash repartiendo regalos. Y por último, la trama que mantiene unidos a todos los relatos, A Very Harley Holiday de Paul Dini y Elsa Charretier, tiene buenos chistes en la voz de la nueva gallina de los huevos de oro de DC, Harley Quinn. El resto, para el olvido. Y si en tu saldo de 11 historias, hay una muy buena y tres que zafan... no, no estaríamos llegando al aprobado ni por asomo. sooo cute. some stories i enjoyed more than others but that’s bound to happen in any short story collection. So much fun! I love seeing my heroes being human. What's more human than the holidays??? Fun, but not quite worth the cover price. Hits and misses, as with any anthology.But that Flash story, though! I dug that one the most. Cute and very much in the holiday spirit. It includes a story about pretty much every single holiday one can think of with just enough action to keep things from getting too sugary sweet. Extra kudos for including some rather obscure characters.One thing, though. It is most definitely NOT worth the exorbitant cover price. The least they could have done was print it as a proper softcover if they were going to make readers fork over so much money. I typically, really enjoy these specials because they remind me of the old "Action Comics Weekly" or "World's Finest". This particular special ranges from good to not so good, so I'd only recommend it if you're a fan of this type of storytelling as I am. Harley Quinn again? I think she must be DC's favourite character. She seems to be in everything! This book is a collection of "Christmas" stories, some ok, some not so much. I bought this on a whim, then found out it was hard to come by. Harley takes us on a very Super-hero themed Christmas in which all the DC stalwarts are involved.